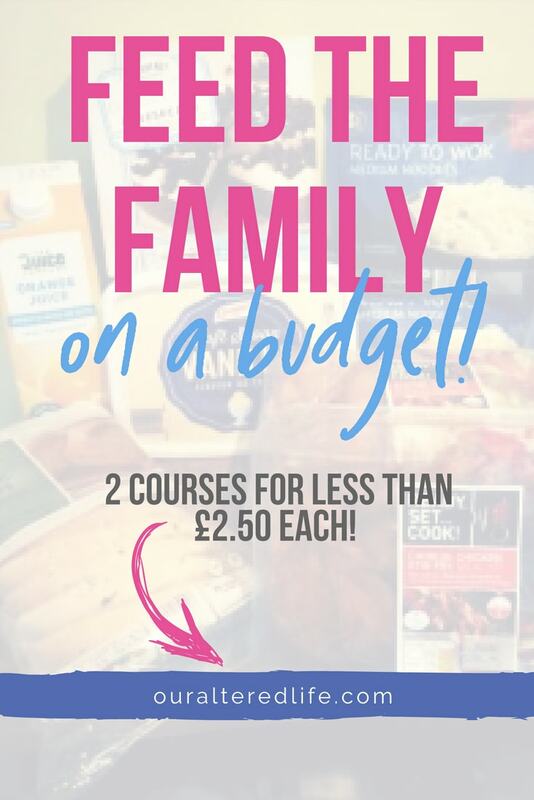 Feeding the family on a budget is a real challenge these days but I feel like its getting even harder in our house! First, the portion sizes in the house have increased as our children have grown. We have Andrews children 2 – 3 times a week and so I am trying to satisfy the equivalent of 6 adult appetites. Second, Oliver is on a fitness kick (which I obviously want to support) but is eating more as he is working out a lot which has an impact on my weekly shopping. Our food bill has gone from £60-70 per week a year ago to around £90 a week now including packed lunches for 2 each day which I don’t think is astronomical but I’d love to see if I could reduce it even a bit. I’m positive that Andrew would agree that meal times in our house is the best time of our day. As the children are growing up they tend to get lost in technology or scatter to their own rooms during the day and so meal times are a techno free zone of catching up and laughter and when the children ask to be excused we hold them hostage for as long as we can. When it comes to what we eat I am a little bit stuck in a rut for a couple of reasons. I tend to do my shopping online which is great for convenience and also saves me the expensive temptation of popping things in the basket that I might not actually need. 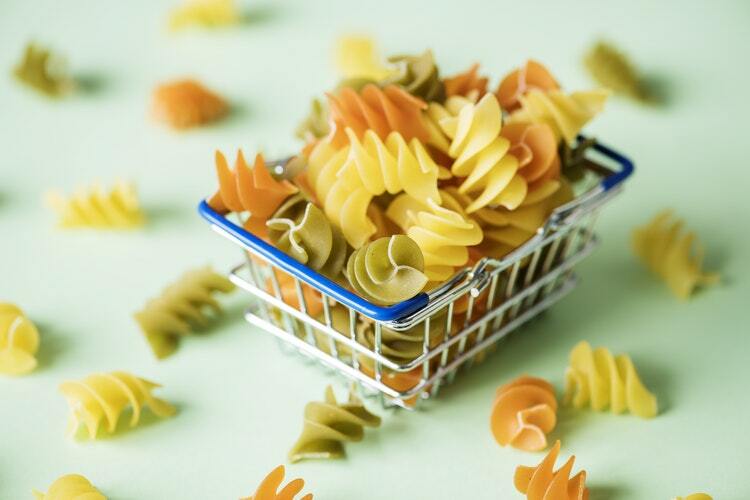 But it also means that I tend to shop from my ‘favourites’ selection for ease and speed and we rotate the same meals on about a 3-week cycle. I do need to get into a supermarket armed with a list and some willpower but I know I’ll fail to stick to either and making the time to actually go means that I just find myself reverting to the ease of my good old faithful app to get sorted. Also, as much as eating food excites me like a child at Christmas, the cooking part really doesn’t inspire me. Whereas my best friend can create a gorgeous meal from some basic ingredients I lack imagination and the courage to try so I worry about buying loads of ingredients only to make a mess of it all and have 6 hungry mouths in the house. 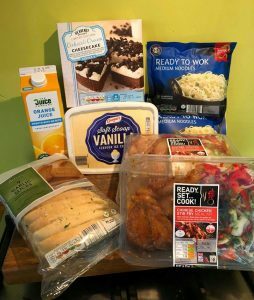 So, I decided to try a new meal, from a new supermarket and dip my toe back into the waters of the ‘real life’ shopping that I did weekly before I got bitten by the convenience bug of online food shopping. 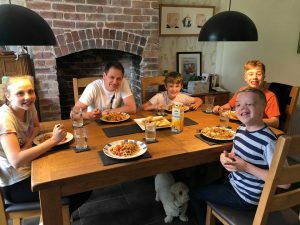 I headed to Aldi and decided to buy the ingredients for a chicken stir fry – a meal which is relatively cheap and easy to put together but one which we haven’t tried as a family before. The chicken packets said they would serve 2 so I bought 3 lots just to make sure (my other issue is that I am a feeder and like to fill our kids up to the brim!) I also bought some garlic bread as its our new obsession, some fresh orange juice, cheesecake and ice cream. I was really impressed to find that I had change from £15 for all of that and even more so when I broke it down per person. For £2.36 each we were all stuffed on a really gorgeous chicken stir fry with noodles, cookies and cream cheese cake and ice cream! (Does anyone else have the conversation when they realise how cheap food like this is about how much profit there is in food within restaurants or is it just us?) We had spent just over £50 in ONE NIGHT recently when we ordered from the Chinese takeaway which worked out at £8.33 each for just one course and we all felt a bit greasy afterwards. The maths speaks for itself! We were all really happy with the food and I was certainly happy with the price so now I need to get a plan of attack together which will involve taking Andrew to Aldi with me for restraint reasons, and writing our weekly meal planner as we go so that we’re not spending even more than usual just because there’s new temptation in front of us. 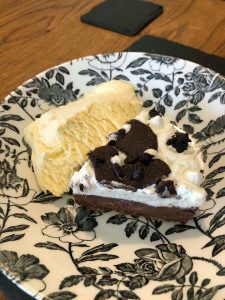 Even if I did that just once a month alongside my usual shopping for now it would mean that one week a month we would be eating something new each night and I’d be saving the pennies – which means more for cheese and gin. Win win! Where do you shop and how do you save money if you’re cooking for a large family? I’d love to know! We find it so hard to eat on a budget, I do find shopping online has reduced the bill as you aren’t tempted by things on the shelves! Pasta and stews help with my big family as a stew can last for a few days and thankfully it’s a much loved meal. Love a good stir fry. For so cheap, you got a good healthy meal and you got a tasty dessert too! I love this idea I only wish they delivered! We never find any time to go to the shop! Oh we are finally getting an Aldi here so I am looking forward to seeing what the hype is about and saving quite a bit of money!